Can you remember something from childhood that you refused to eat and just clamor for now? I need to learn how to love a radish. I did not like radishes. I picked them out of salads and didn’t understand why they were there. One bite into the mustardy, peppery no purpose vegetable and my mouth would turn bitter. I didn’t get it. A little research explained to me that the horseradish and wasabi get their pungent pepperiness from the same chemical combination as does a radish, (for you food geeks, this is caused by glucosinolates and the enzyme myrosinase which form allyl isothiocyantes when chewed ). A light bulb went on. No one sits around and chews on wasabi. 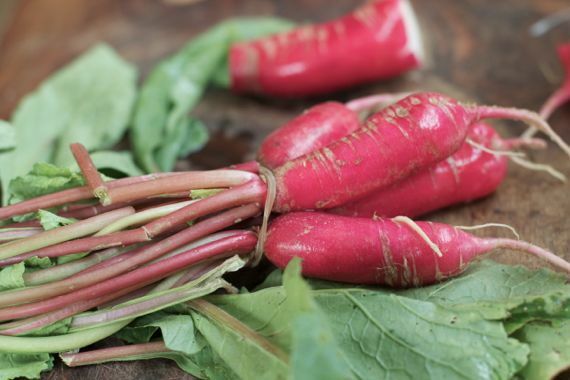 It is served to offset other flavors and textures, to complement a dish, to bring to a bite just one element and I thought maybe if I just combine radishes with the right foods, I’ll come to appreciate this pretty little vegetable. Give them to me roasted and I get excited. Give them to me in a salad of olive oil and champagne vinegar and I turn into a radish lover. Or slice them over buttered dark bread with salt and pepper and I’ll think I’m in France enjoying the simple yet wonderful bites of life. 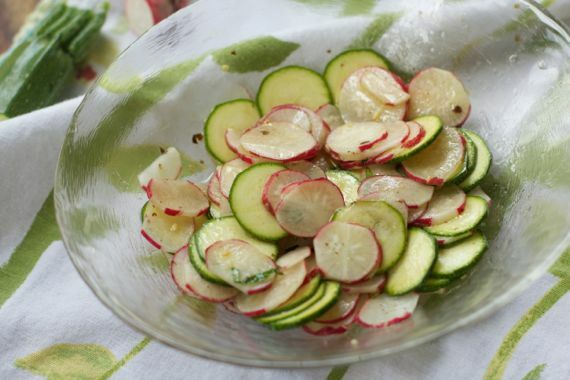 Recently, I just sliced some gorgeous french radishes, and ate them in a salad, and even decided to add some fresh zucchini that I picked from my garden. 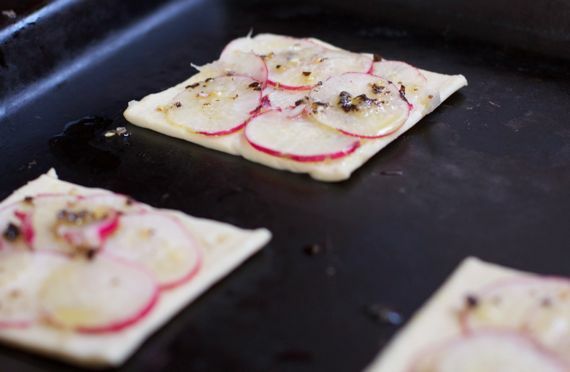 Wait, you didn’t know you could roast radishes? 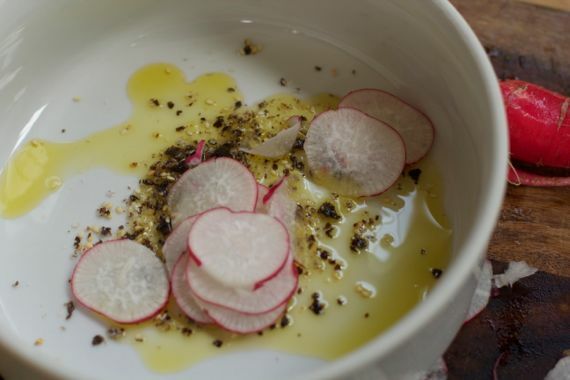 If you’re not too fond of the zing the radish delivers, then try roasting them. You can make it simple with a tiny bit of olive oil and sea salt. 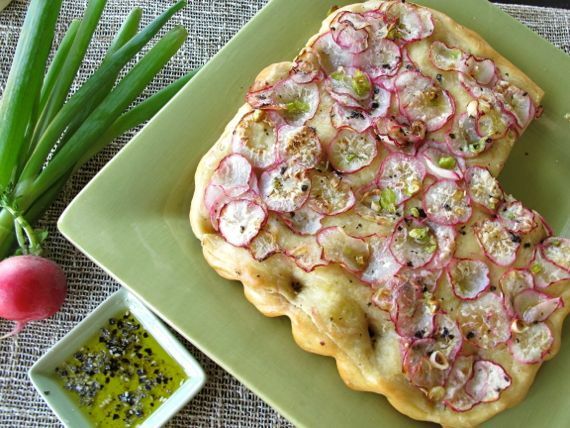 I discovered roasting when I made this roasted radish foccaccia that won a small cooking contest. 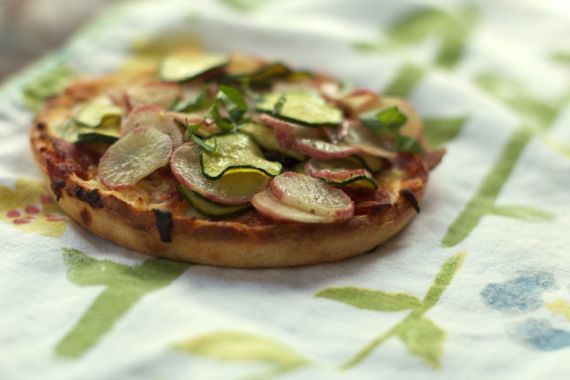 A radish brings style to a frozen mini pizza. 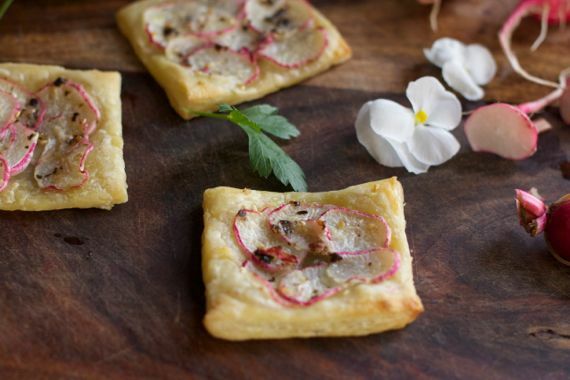 No time for foccacia, try topping puff pastry with radishes, tiny bit of olive oil, and nori sea salt for a surprising appetizer. 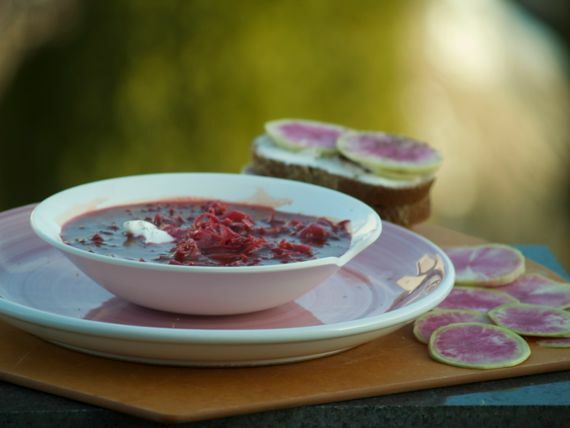 Get fancy and make watermelon radishes sandwiches to serve with borscht. The key is a good bread with cold, thick butter, and a sprinkling of dill. Tell me, do you eat radishes or do you shy away like I used to? 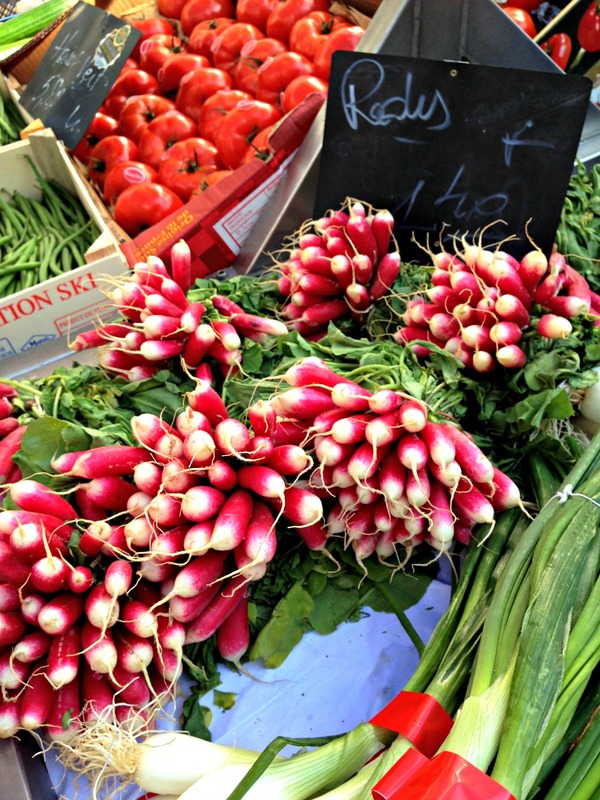 What’s your favorite radish recipe? I loved radishes and a kid, and still do. They were always in my Mom’s everyday green salads along with mushrooms, green onions and chopped parsley. I mostly encounter radishes (or rabanitos, as they’re known in Spanish) in our local Mexican restaurants. I should say, in the AUTHENTIC Mexican restaurants. And they are found at the Salsa Bar, along with lime wedges, pickled carrots and jalapenos (escabeche). They are sprinkled atop the rich, red chile and pork soup, Pozole, and on just about any heavy, meaty dish to achieve just what you described…a fresh, lively zing. But your recipes, and have never seen! They look wonderful! I love how you showcase and celebrate the simplest, humble veggie and make it gourmet! Thanks, girl! Intead of ceating popcorn in front of the TV, I used to wash the radishes and salt them up and just enjoy them one by one…. I think radishes are a very adult taste..I do not know many children who “relish a radish”. They, like many foods, are not really appreciated until later in life. I really don’t remember being served radishes when I was a child. I must have been and shut it out of my mind! Now, like you, I love them. Sandwiches are spiced up with sliced radishes, sauteed in olive oil & sprinkled with sea salt and pickled with red onions are some of my favorites. I like so much what you have done with your radishes. Many more ideas to try Angela. I am just like you! Thought I didn’t like radishes until I learned I could roast them. Super delicious! I just recently started to develop a greater appreciation for the humble radish, and when we actually grew some last summer I ate an awful lot of them. Picked straight out of the ground on a warm summer morning, & given a quick rinse under the garden tap, they are hard to beat. They certainly found their way into a lot of my salads last summer – I’m guessing this coming summer will be no different. I just recently started appreciating radish – but only in their naked (raw) form. I love all the suggestions you presented here. I will be expanding the repertoire! Okay…..I’m ready to jump into the deep end of the pool and try these recipes. They sound GOOD…..but dangerous to this neophyte. Angela oddly enough ever since I was a little girl I’ve loved radishes. In fact, I eat them like they’re apples. I use to wash them and sprinkle salt on them, something I wouldn’t consider doing now but still enjoy them on their own. I can easily eat 4-5 of them at one time. I love them. However, I’ve never cooked with them so this will be something new for me to try. I’ve just enjoyed them in the raw. Thanks for the inspiration! Gorgeous recipes! I’m particularly tempted by the foccacia.